And now for the woodpecker action I promised in an earlier post…. 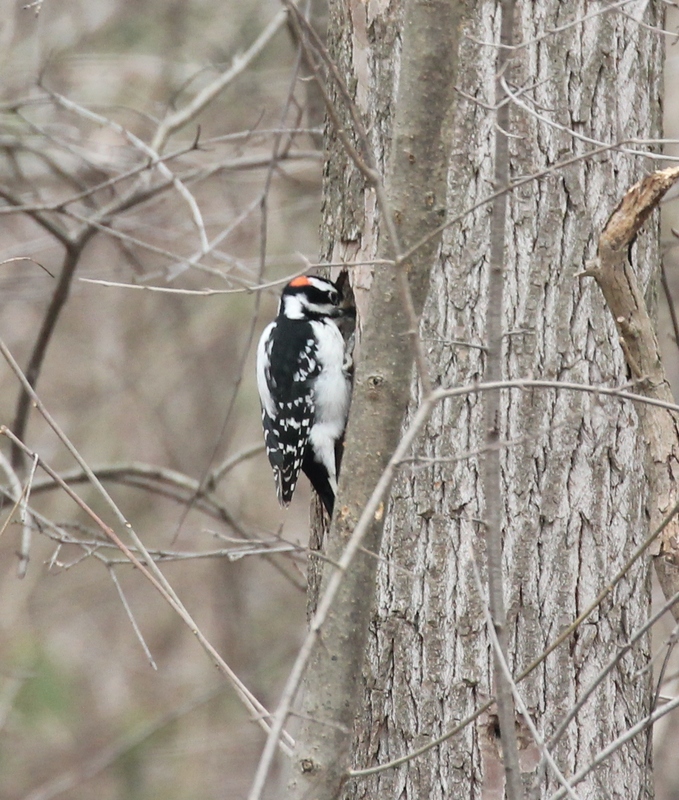 The red on the back of the head tells us this is a male Hairy Woodpecker. 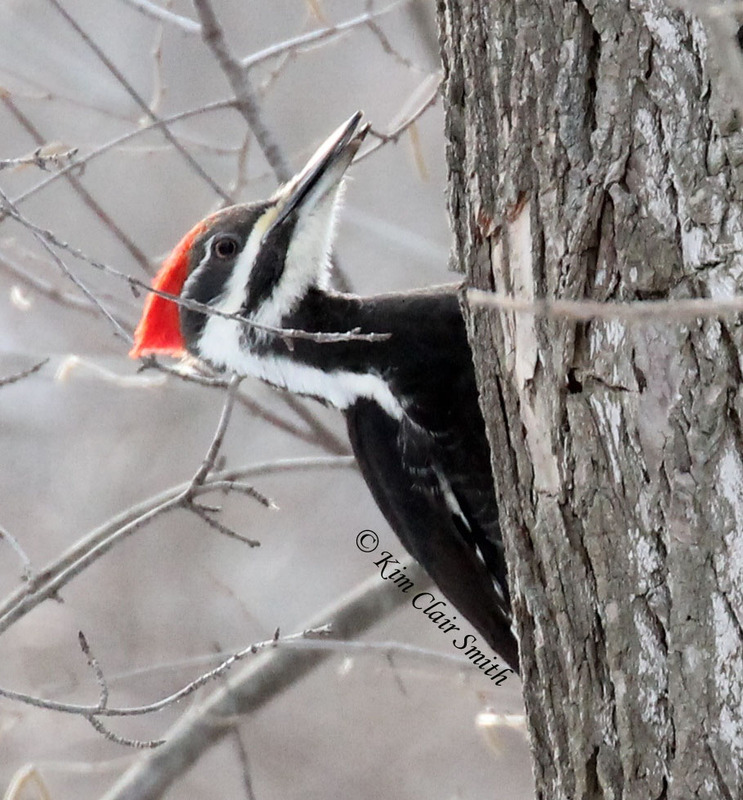 The other day, I looked out the kitchen window and saw a Hairy Woodpecker stashing peanuts in some holes drilled in a sassafras tree by a Pileated Woodpecker a couple years ago. Red-bellied Woodpecker (female) after she bumped the Hairy off her spot! And as if that wasn’t cute enough, a moment later he was bumped off his spot by a female Red-bellied Woodpecker, who proceeded to stash her own peanut in the same hole (or maybe she was taking his out). It happened so fast that if I’d blinked I would have thought the Hairy had magically turned into a Red-bellied. I’ve seen the Red-bellies do that same move before — back in January as I was watching my first ever Fox Sparrow on the ground below our feeders, suddenly a Red-belly landed practically on top of him. I think they’ve got a bit of an aggressive streak, or else they just don’t watch where they’re going very carefully! As fun as it was to see the interaction of the Hairy and Red-belly, I got to see a much rarer interaction a few days later at the same tree. As I walked out the driveway to get the mail one afternoon, I spotted a Pileated Woodpecker in the woods across the road. Excited at the possibility that it would come over to our yard, I ran inside to get my binoculars and camera. When I came back the bird was nowhere in sight. Disappointed, I went back inside, but stationed myself at the kitchen windows so I could keep an eye out in case he/she came back. I couldn’t believe my luck when she did come into the yard less than 20 minutes later! And even more interesting, she went right to those same sassafras trees (we have five of them side by side in that part of the yard). She began chipping away at the bark in several different spots at first, then settled on one spot and really got busy. 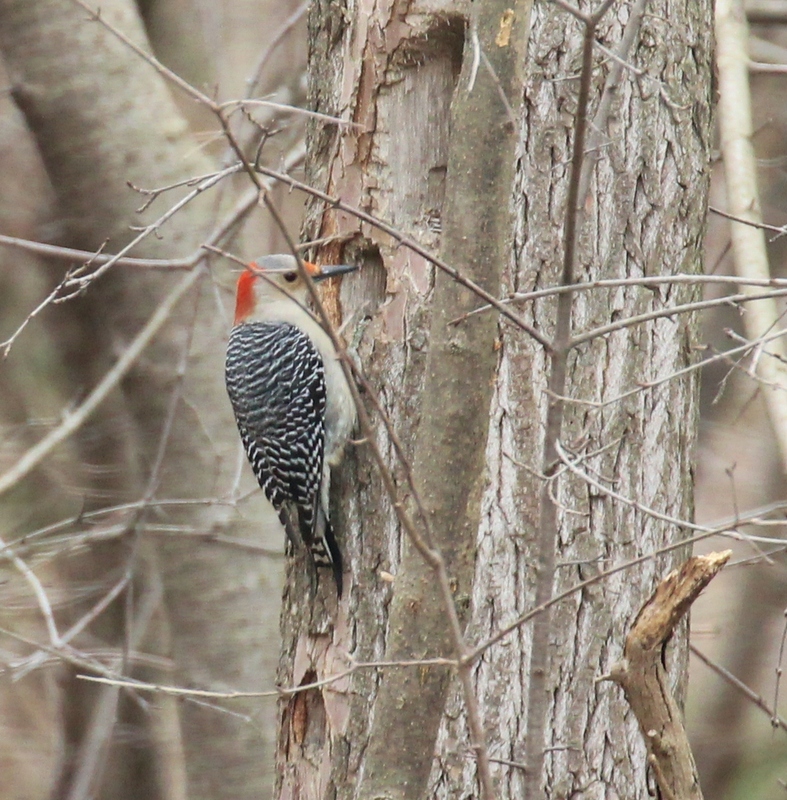 But the resident Red-bellied Woodpeckers apparently didn’t want her here, and they tried to chase her away. They were unsuccessful and gave up after a few minutes, leaving her to spend the next 45 minutes drilling a hole big enough to put her entire head inside the tree. Red-bellied woodpecker and Pileated woodpecker — look at the size difference! 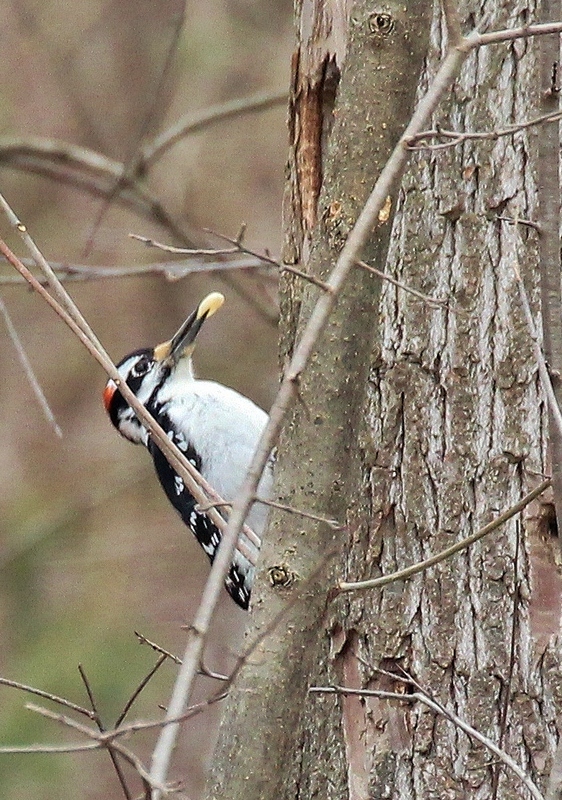 But I got a great photo with both woodpecker species in the same frame, showing the big size difference. 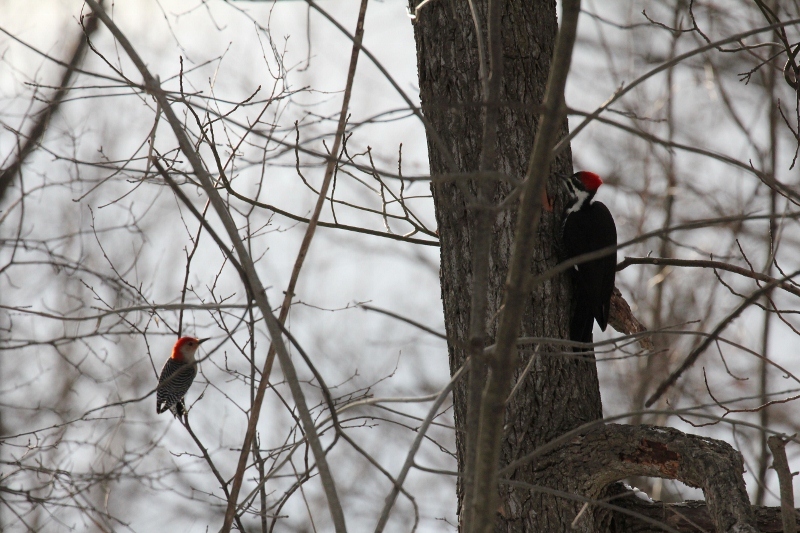 Usually the Red-bellied Woodpeckers are one of the largest birds in our yard, but this one looks so tiny next to the Pileated, doesn’t he? I was thrilled to be able to watch her for so long, and after she finished drilling that large hole she flew across the road and was gone. I was hoping maybe she was going to make a nest hole, but I think this was just a hunt for ants inside the tree. Since these big birds have territories from 150-200 acres in size, our property is just a small portion of their home base. I guess that’s why we’ve only seen two of them in the past several years here. I went out to check out the holes after she left. These two shots show the holes dug in previous years compared to the new ones; see how the exposed inner bark is brown on the new ones? This entry was posted in Birds and tagged anisodactyl, bird feet, Hairy Woodpecker, Pileated Woodpecker, Red-bellied Woodpecker, toes, woodpecker, zygodactyl. Bookmark the permalink. 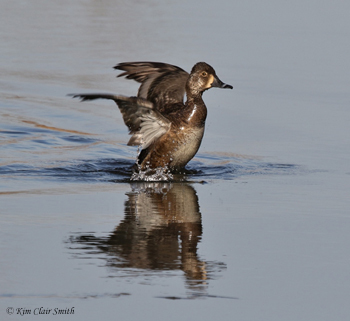 10 Responses to Zygodactyl Feet? Who Me? I LOVE the photos, and the video, Kim! Your post makes me want to do some birdwatching! 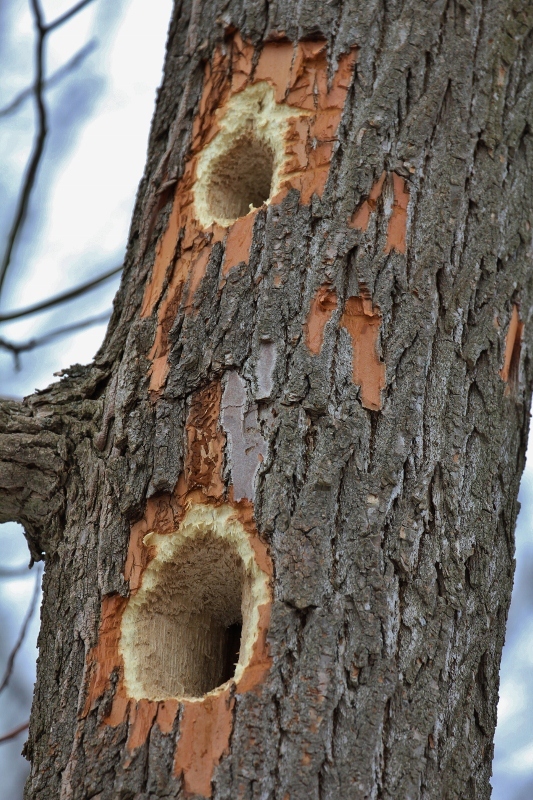 I love to watch woodpeckers; I had no idea, however, that they made such big holes! I was shocked when you said you’ve had to patch holes in your wood siding from them; I never thought of that happening; how crazy is that? Great post, and beautiful photos!!! Thanks, Jules! Yeah, they really go to town on our house occasionally. I’d like to replace all the wood siding to eliminate the problem, but I bet they’d drive us nuts pounding on aluminum siding too, lol. This is just fascinating!! I have only seen Pileated Woodpeckers in SE Oklahoma. FD actually spotted one here in our woods about 3 years ago. We do have a photo but it was taken from a distance. We did report it to the local ornithology group out of Oklahoma City. The power generation facility FD works for spends a lot of money down in the SE part of the state, protecting transmission structures from damage created by the Pileated Woodpeckers! They basically have to mesh wire miles of transmission lines, completely wrapping each structure! I know they can be destructive. 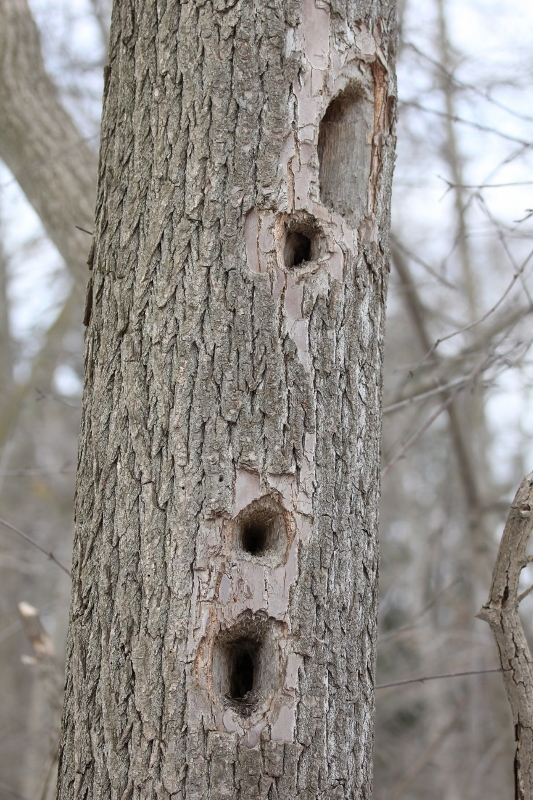 We’ve had to patch many holes in our wood siding from the Red-bellied Woodpeckers! I love this post, Kim! The pictures of the woodpeckers are great. I love how you humanize their actions–you really make them come to life with your vivid descriptions. 🙂 I was amazed at the large holes they made… and that video is priceless! haha–I had no idea how hard they work to make those holes and the classical music made it so entertaining. You are so creative, Kim! Thanks for sharing this. Send us a picture of the deer eating the leaves from the tree on your deck! I would love to see that. The woodpeckers are so colorful.